In four short years in the Department of Social Work, Shreya Bhandari, Ph.D., has made a name for herself. She not only established herself as an internationally known researcher in the area of intimate partner violence, but also is an innovative teacher of cultural competency, an advocate for service learning, and an active member of the community. Hired as a full-time instructor in 2010 and then as an assistant professor in 2012, Bhandari has published nine peer-reviewed scholarly articles. 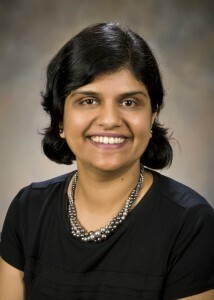 Through her extensive research on coping strategies of pregnant rural women experiencing intimate partner violence (IPV), the impact of such violence on South Asian American women, and the cultural factors related to IPV, Bhandari clearly demonstrates her expertise in qualitative research methods. She has presented her research at seven national and international conferences. She has received funding from the LEADER grant of the National Science Foundation and the College of Liberal Arts Faculty Research Activity at Wright State to conduct her research. In the classroom, Bhandari excels in increasing the cultural sensitivity and awareness among persons of diverse backgrounds through her service-learning approach. She teaches throughout the undergraduate and graduate social work curriculum in areas of research methods, social welfare policy, and cultural competency. Bhandari plays an extraordinary role in Wright State’s social work department and in the community. She is an active participant in department faculty meetings, annual retreats, Professional Advisory Council, Master’s of Arts in Social Work Committee, Marketing Committee, and faculty search committee. She is the faculty liaison to the Social Work Club, which is active and holds more five fundraisers for local charities each year. She also has provided consultation to local agencies providing services to victims of domestic violence.